It is a real delight to join you again at the "Chinese Bridge" competition. Every time I speak at the "Chinese Bridge", I struggle over whether I should speak Chinese or English. Last year Minister Counsellor Wang Yongli suggested I speak Chinese, because this is a Chinese proficiency competition. I accepted his suggestion and spoke Chinese, but I found that most British friends in the audience could not understand, and it was not a communication success. Language is not learned in a day. So I have decided to speak English tonight. Before doing it I would like to double-check if my decision is right. Let's do a survey. Those who don't understand Chinese, please raise your hand. It seems I am right in choosing to speak English. Nevertheless I hope that in the near future, I could speak Chinese at the "Chinese Bridge". Tonight's "Chinese Bridge" is special. 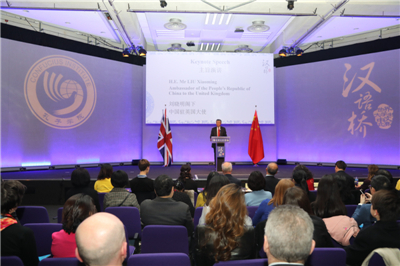 It is the 18th"Chinese Bridge" Chinese Proficiency Competition UK Regional Final. In China as well as the UK, the age of 18 is a milestone in life. It marks the end of adolescence and the beginning of adulthood. In the past 18 years, the "Chinese Bridge" has grown from obscurity to international fame. It is now a brand name for cultural exchange between China and the world. This could not have been possible without the ardent support and active participation of all of you present today. I would like to give the thumbs up to all the students who have been devoted to learning Chinese! I would also like to pay tribute to all the teachers. Thank you for your hard work over the years to impart knowledge about the Chinese language and culture to the British people! My thanks also go to those from both our two countries who have given their care and support for the "Chinese Bridge"! This year marks the 65th anniversary of the establishment of China-UK diplomatic relationship at the level of chargé d'affaires. 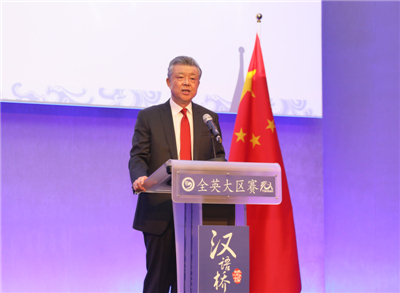 Education has been an important driving force for China-UK relations. It has provided nourishment for China-UK friendship. And it has been one of the most dynamic and promising areas of China-UK cooperation. Ancient Chinese philosopher Zhuangzi said, "A simple endeavour could have significant influence." The "Chinese Bridge" is such a simple endeavour of great significance. For Chinese language proficiency, "Chinese Bridge" is a "centre of quality inspection" and a "display of excellent results". It is also a crown jewel of China-UK cooperation. It begins with language learning but is more than language learning. It originates in China and gains popularity all over the world. It starts in the classrooms and ends in people's heart. To know where we are going next, we should never forget why we started in the first place. At this coming-of-age moment for the "Chinese Bridge", it is necessary to ask yourself this question: Why do you want to learn Chinese? First, the Chinese language is a bridge leading to the world of profound Chinese cultural charm. Language is the basic element of the culture of a country and a nation. The Chinese language holds the key to the five-thousand-year uninterrupted Chinese civilisation. "Treat other's kin and children as your own; Let all the elderly be supported, the young be employed and the children be educated; Ensure all the widowers, the widows, the orphans, the childless elders, the disabled and the sick are properly taken care of." "Harmony arises from the ability to appreciate different cultures for their unique beauty." These adages are the very root of the ideals of good-neighbourliness and harmony, which the Chinese people hold dear. are all parts of a continuous, uninterrupted 5,000 year history of the Chinese nation. This is the key to understanding China's past, present and future. 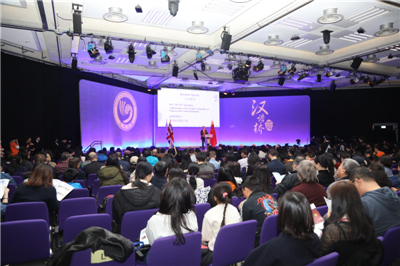 Second, language is a bridge for win-win cooperation between China and the UK. Over the past years, learning the Chinese language has become increasingly popular in Britain. In 2017, the "Mandarin Excellence Programme" was introduced to primary and secondary schools in England. As of today, the programme has covered more than 1,300 students from 64 schools. In 2018, the Chinese language overtook German for the first time and became the third most popular foreign language in A-level exams. Chinese and British education institutions have jointly built 29 Confucius Institutes and 161 Confucius Classrooms, which have become popular platforms to learn the Chinese language and culture. At the same time, more and more Chinese students choose to study in Britain. In 2010, my first year as Chinese Ambassador to the UK, there were about 130,000 Chinese students here. Today, after nine years, this figure has increased to 190,000. All these figures reflect the close bond between the Chinese and British people. They also demonstrate the vigour of China-UK cultural and people-to-people exchanges. Third, language is a bridge for exchanges and mutual learning between Eastern and Western civilisations. In an age of deepening multi-polarisation, economic globalisation and cultural diversity, the communication between people and the exchanges and mutual learning between civilisations are becoming increasingly important. Learning a foreign language gives us a tool for such communication and exchanges. This helps us understand differences and seek common grounds. This also builds the foundation for equality and mutual respect. China and the UK differ in social system, history, culture and development stage. But both have created profound civilisations, and many of our values are similar. For example, the British people prize the qualities of elegance, honesty and independence, while the Chinese people value benevolence, integrity, courtesy, wisdom and good faith. As long as we overcome the barrier of language, we could reach a new stage of better understanding and stronger consensus. Ludwig Wittgenstein said, "The limits of my language are the limits of my world." I hope the "Chinese Bridge" competition will help us break the limits of ability and knowledge, and encourage more people to learn the Chinese language and understand China. This will be an important contribution to advancing the China-UK "Golden Era" and building a community with a shared future for mankind! In conclusion, I wish all the contestants success in this competition. I hope you will become super stars of the "Chinese Bridge"! The 18th "Chinese Bridge" Chinese Proficiency Competition UK Regional Final now begins!